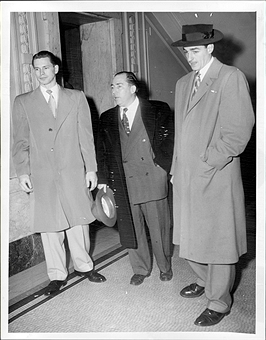 In January of 1951, Hank Poppe (shown to the left of the Bronx DA) was the ex-player who approached Junius Kellogg to shave points in a basketball game against DePaul. We have talked about Poppe at length. 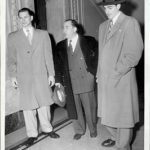 However, he had a co-conspirator, Jack “Jackie” Byrnes (left of the Bronx, DA), who was not as connected to the mob as was Poppe, but was in on the fixes when he was in his junior and senior years at Manhattan College. Together, Poppe and Byrnes made a great deal of money for a couple of young guys (upwards of $10,000 in 1951 dollars). Byrnes played center, and he learned how to cheat and miss points when gambled money was on the line. In fact in January 1951, about 10 days after the scandal, Life magazine published an expose on the scandal and it showed “freeze frames” from clips of Poppe and Byrnes working together to intentionally miss passes and shots. While Poppe was a hustler who liked the action (and who knows where it would have led? ), Jackie wanted to play professional basketball. After graduation, he was playing semi-pro basketball in Connecticut for a “forerunner” team of the American Basketball Association. In some ways, Jack was more dangerous to the sport itself than Poppe. He was one of a few players who had been involved in fixing who had worked himself into professional sports. I always had the impression that Jack Byrnes was Poppe’s dupe. He was a not too bright guy who never understood how Poppe was using him. When the scandal was uncovered, Jack was forced to leave pro basketball. While his ex-coach, Ken Norton, had an absolute hatred of Poppe for what he had done to the Manhattan College he was disappointed in Byrnes for what he had done to his basketball career. Byrnes had potential as he was more of a prototypical NBA player. Jackie Byrnes might have faded into basketball history had not I uncovered the following anecdote. This story related by John Powers, former Manhattan College Athletic Director, coach and before that, Jaspers basketball star: In the late 1960s, he and Ken Norton (who was also the golf coach) played a round at the Seton Hall Golf Course. After they were done, Norton and Powers decided to have a drink at the club house. Norton called over to the bartender for a scotch and soda. The bartender didn’t budge. Norton impatiently called again. The bartender reluctantly walked over. He said, “Coach, how’re you doing?” At first, Norton had no idea who the man was. The bartender said, “It’s me, Jackie, Jack Byrnes.” Norton looked at the man. Byrnes put out his hand and Norton shook it. Nothing else was said. Byrnes had gone from professional basketball to pouring drinks. He had thrown away a possible professional career.